Preserving land for farms and community gardens, developing new ways of farming organically and regeneratively, buying local food, and developing local food processing are all part creating food security. Greenfield is blessed with rich agricultural land in town, and up and down the Valley! While today, approximately 80% of our food is imported, the potential to grow our food locally is huge! Local food is fresher, and it cuts down on fuel use to transport food to us. If the food is grown organically, chemical fertilizers made from petroleum can also be eliminated. The area is rich with farmers that grow local vegetables and fruit, eggs, and meat. Several farmers are experimenting with growing wheat, and the valley is a center for permaculture including no-til and forest gardening. The Farmers’ Cooperative Exchange offers farm and gardening supplies. In Greenfield: We have numerous outlets for locally-grown food, as well as a Town Farm, two Community Gardens and many farmers! Several restaurants specialize in offering dishes made with locally-produced vegetables, meat and more. Green Fields Market that specializes in locally-grown organic produce and many locally- produced items from fish, to pickles and meat substitutes. 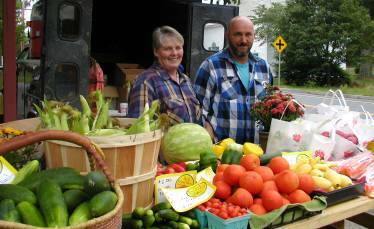 Other supermarkets such as locally-owned Foster’s and the Big Y, offer local produce. Two Farmers’ markets. In Greenfield. One is held on Saturdays from May-Oct in front of the Town Hall. Another is held on Tuesdays at the Grange. Community Supported Agriculture (CSA’s) that offer locally-grown and/or organic produce for a flat fee to subscribers. Just Roots is committed to making healthy, local food accessible for all. They manage 45 acres on Leyden Road that includes The Greenfield Community Farm, The Just Roots Community Garden, and educational opportunities. They also manage the Pleasant Street Community Garden at Davis and Pleasant Streets in downtown Greenfield. The Franklin County Agricultural Society runs the longest running county fair in the country and maintains the historic County Fairgrounds including the Roundhouse. There is also a very active 4-H club in the area. In 2012, FRCOG commissioned Franklin County Farmland and Foodshed Study from the Conway School of Landscape Design. Interesting finding was that we have enough land to feed ourselves, but that we cannot be the breadbasket for New York and New England, as we were in collonial times. For the full report click here. Many vegetable, fruit, dairy and meat farmers throughout the Valley. Please add to this list by filling in the comment box!